The Azure Window was a natural limestone arch that rose majestically out of the blue Mediterranean sea to a height of 28 metres (92 feet). 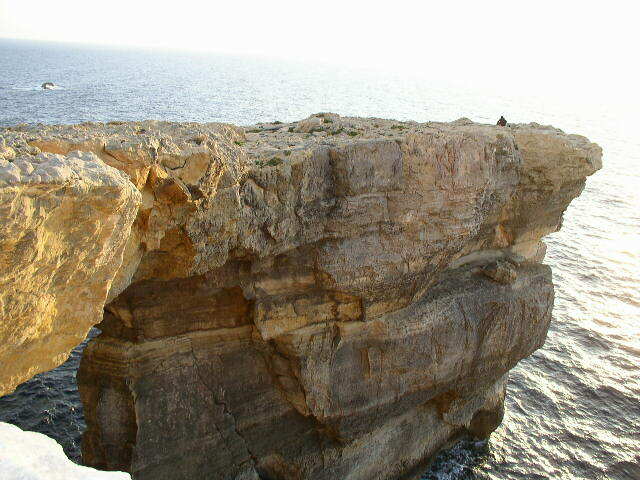 It was located in Dwejra, Gozo. The arch was created when two limestone caves collapsed on some unrecorded day in history. 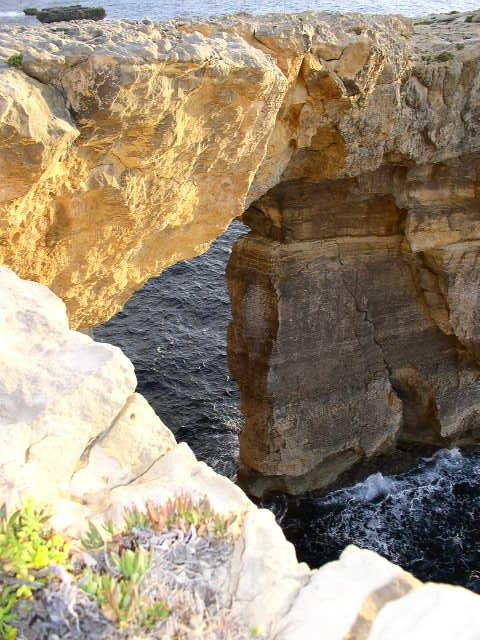 It was a natural attraction much-loved both by the Maltese and by thousands of tourists who visited it on a daily basis and captured its unique beauty in countless images. After a night of storms and gale-force winds, the arch succumbed to the elements and it collapsed into the sea this morning. Nothing is left where the arch once stood, not even the stacks. 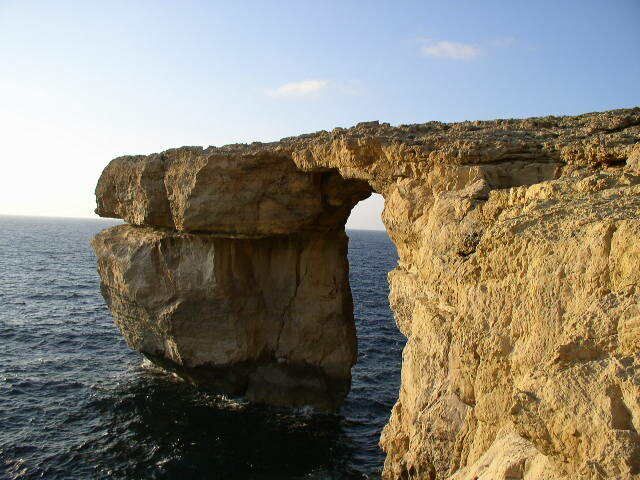 This iconic feature is gone forever and the Azure Window will not only live on in our memories and our photographs. Thankfully, in this age of social media, images and videos of the Azure Window are plentiful but it is still sad to think that there will be generations of children who will grow up without seeing it for themselves. During its lifetime, the Azure Window was the backdrop for some scenes in movies like Clash of the Titans (1981), The Count of Monte Cristo (2002) and in the TV series Game of Thrones. In 2016, clothing designer Hugo Boss shot an ad campaign featuring cliff diver David Colturi jumping off of the Azure Window. Hugo Boss - Superblack suit from Kopterworx on Vimeo. The photos in this article were taken almost exactly 14 years ago on 5th March 2003. If you're visiting Malta in summer you may be tempted to spend your days at the beach. But Malta has a lot more to offer during the summer months than sun, sea and sand. So I have compiled a list of ordinary and not so ordinary things that you can do in Malta during the summer months. Although this event is aimed at the young, you will still find several older people among the audience. This concert has been held in Malta since 2006 so, this year, it will be celebrating it's tenth edition. Usually held at the end of June, this year's concert will take place on the 28th of June (the eve of a public holiday) at the usual venue - the Granaries in Floriana. This year's line-up includes Jess Glynne, Wiz Khalifa, Steve Aoki and Malta's own Airport Impressions. The concert starts at 6.30pm. General admission is free. More information here. Amorino is one of the latest ice-cream parlours to open up in Malta but it is definitely one of my favourites. The ice-cream flavours are distinct and delicious, with my personal favourites being chocolate and amarena. Apart from ice-creams, Amorino also has a good selection of sorbets, ice-creams macarons and other sweet treats. This suggestion, of course, is a no-brainer. There is no better way to cool down than to take a swim in the turquoise-blue waters for which this island is so renowned. There are a number of beaches that are easily accessible by public transport, so it is not necessary to hire your own car to get to them. While sandy beaches are generally more popular, the scenery at rocky beaches usually tends to be more spectacular. Bear in mind that all beaches will be crowded on Sundays and public holidays. Popular sandy beaches: Ghadira, Golden Bay, Paradise Bay, Gnejna, Pretty Bay. Popular rocky beaches: Ghar Lapsi, Sliema seafront, St Peter's Pool (this bay is not easily accessible), Bahar ic-Caghaq. Hot summer days ensure that sunsets are particularly fiery and the sun paints the sky with a variety of colours before disappearing over the horizon. You can catch a good sunset from anywhere along the western coast. You can read about three of the best places to enjoy sunsets here. Harbour cruises are a great way of learning about the history of Grand Harbour and the cities that surround it, of seeing the scenery from a different perspective and of keeping cool - the moving boats ensure this. Most harbour cruises depart from Tigne Seafront (the Ferries) in Sliema. Popular harbour cruises are organised by Captain Morgan and Luzzu Cruises. Prices start from 16 EUR for adults and 13 EUR for children. Heritage Malta organises tours at the temples of Mnajdra and Hagar Qim on the day of the summer solstice. During these tours, visitors will be able to experience for themselves the beauty and mystery of these ancient temples that are considered to be amongst the oldest man-made structures in the world. Admission to these tours is €25.00. More information may be found on the Heritage Malta website. This event usually takes place on June 20th and 21st. If exuberant religious celebrations, fireworks and band marches are your thing, attending a festa is an experience not to be missed. These celebrations in honour of the patron saint of a town or village take place every weekend from the beginning of May till mid-September. The festa season culminates in mid-August when seven villages in Malta and two in Gozo celebrate the feast of the Assumption of Mary. It would be good to keep in mind that a festa is not for the faint-hearted. The bangs from the fireworks are ear-shattering, the church bells ring non-stop, the air is thick with the smell of sulphur and the streets will be crowded. This is one celebration that you will either love or hate. Every year, the popular theatre group MADC performs one of William Shakespeare's plays at San Anton Palace gardens. San Anton gardens surround the palace that was built as a summer residence for the Grand Masters by Grand Master Antoine de Paule. Today it is the official residence of the President of Malta. This year, MADC will be performing the popular comedy 'A Midsummer's Night Dream'. Performances will take place between the 15th and 24th of July. Two of the major wine producers in Malta, Marsovin and Delicata, organise a wine festival during the summer months. The Marsovin Wine Festival usually takes place at Hastings Garden (Valletta). This year it will be held between July 15th and 17th from 8pm to 1 am. The Delicata Wine Festival will celebrate it's 15th anniversary at its usual venue, the Upper Barrakka Gardens in Valletta. This wine festival will take place between the 4th and 7th August from 7pm till midnight. The venues for both wine festivals offer fantastic views of Marsamxett Harbour and Grand Harbour respectively. A variety of food will also be on sale and a number of local bands and musicians will provide entertainment throughout the night. However, without a doubt, the star of both festivals will be the wine. The Malta Jazz Festival, organised by the Malta Arts Council, is now in its 26th edition. It usually features well-known artists in this genre - and this year is no exception. A variety of styles will be represented by the most significant bands and musicians in this sector. This year's performers include Snarky Puppy, Omer Avital, Mike Stern and Bill Evans. The chapel of St Michael nicknamed 'is-Sancier' (the sincere) is located on the outskirts of the town of Rabat. It is one of the oldest chapels still standing in its original form. Low and squat, it is partly built of rough-hewn stones, blending in with the rural landscape that surrounds it. The chapel of St Michael is located in a zone that has yielded many shreds of Punic, Roman and medieval pottery. St Michael's was probably constructed during the middle of the fifteenth century. In 1678 it was deconsecrated and the titular painting of St Michael was transferred to the parish church of St Paul, in Rabat. For many years the chapel was used by farmers as a store for tools and as a cow-shed. In 1981 the chapel was cleaned and restored by a group of volunteers but, since that time, it has fallen into disrepair, with all sorts of weeds and other types of small plants growing on the façade, together with an insidious type of wild ivy, whose roots and tendrils are wreaking havoc on the crumbling, centuries-old stone-work. The side-entrance is almost completely obstructed by bamboo and the interior of the chapel is ravaged by rising damp. It is a pity that one of the few surviving structures from the medieval period in Malta is rotting away with no foreseeable plans in the near future to carry out the professional restoration that it so badly deserves. A lazzaretto is a quarantine station for maritime travellers. Passengers arriving on board ships from infected countries had to spend a number of days (usually around forty) in quarantine before being allowed to mingle with the inhabitants. This was done so as to ensure that any symptoms of the disease would be manifested and, as a result of this preventive measure, the infection would not be spread to the rest of the population. The first lazzaretto was set up on Manoel Island in 1592 during an outbreak of the plague. At that time, temprary wooden huts were set up. These were later demolished. In 1643, Grand Master Lascaris, built a permanent structure in the same place to control the periodic outbreaks of plague and cholera on board visiting ships. The building consists of two floors with eight rooms on each floor surrounding a central courtyard. A series of arches runs along the facade facing the sea. Persons who died in the lazzaretto were buried on Manoel Island in one of six cemeteries that existed there at different times. Additional buldings were added from time to time, depending on the exigencies of the moment. In 1670, Grand Master Nicholas Cotoner made some improvements on the building constructed by Lascaris. Stores and warehosues were erected to house merchandise from infected ports, together with facilities for disinfection and fumigation. The lazzaretto was enlarged further between 1837-38 under the governship of Sir Henry Frederick Bouverie. Some famous visitors kept in isolation in the lazzaretto on Manoel Island were Lord Byron, Sir Walter Scott, William Thackeray, the Reverend (later Cardinal) John Henry Newman and a young Benjamin Disraeli. The lazzaretto on Manoel island was used as recently as 1937 when there was an outbreak of the plague. During WW2 it was damaged and eventually fell into a state of disrepair. In spite of plans to restore it, it is still an abandoned shell, slowly crumbling into the sea. This palace, originally built in 1569, was purchased in the 1570s by Grand Master Jean de la Cassiere and subsequently enlarged by Maltese architect Girolamo Cassar. Situated in the heart of Valletta, opposite St George's Square, it is the capital city's largest palace. The facade, designed in a rather severe Mannerist style, belies the richness of the interior. From the 16th century, until the Knights left Malta in 1798, the palace served as the official residence of the Grand Master of the order of St John and was known as the Magisterial Palace. During the British period it became the Governor's Palace. It currently hosues the offices of the President of Malta. The palace was also the seat of Malta's first constitutional parliament in 1921. Although the Grandmaster's Palace occupies a whole city block, it is nowhere near as grand, or on as large a scale, as European palaces like Versailles, the Schonbrunn or any other palace built for royalty - after all, even though the Knights were members of some of the most prominent aristocratic families of Europe, they were a religious order. Which does not mean they lived in misery because the palace has its own innate charm and architectural grandeur. A unique and intact set of Gobelin tapesteries named “Les Teintures des Indes”, a gift to the Order from Grand Master Ramon Perellos in 1710, decorate the Council Chamber (sorry no photos allowed but you may take a virtual tour by going to the link at the bottom of this post). The ceilings and corridors are lavishly decorated with frescoes of naval battles, coats of arms and allegorical scenes. Portraits of the Grand Masters hang on the walls and suits of armour line the corridors. Five State rooms are open to the public, including the Red and Yellow State Rooms, the Hall of the Supreme Council and the State Dining Room. The palace is built around two courtyards - one of which is dominated by a bronze statue of Neptune. The palace armoury is located on the ground floor, in what used to be the palace stables (more on the armoury some other time). Closed on 24, 25 & 31 December, 1 January & Good Friday. The Palace and Armoury may be also closed on other days due to state functions and activities. I don’t know whether you agree with me but I find the old shop-fronts of Valletta endlessly fascinating. Without knowing it, it seems that I’ve taken it upon myself to photograph all the ones I can find before they disappear forever. The National War Museum has moved from the old Drill Hall of lower Fort St Elmo to the actual Fort itself. The entrance ticket is valid for both which means that you can tour the fort while visiting the museum. Fort St Elmo played a crucial role during the siege of 1565. The Knights defended it to the last man and, when it fell on June 23 1565, no defenders were left alive. But it cost the invading Turks many men and a lot of ammunition. I don’t know whether it was a coincidence or a strange twist of fate, but t he first casualties of World War 2 occurred at Fort St Elmo in June of 1940. Due to its long and varied history, Fort St Elmo deserves a post all to itself so I will leave that to another time. The National War Museum houses a collection of items that date back to prehistoric times. The items are displayed in chronological order and span over four thousand years of history. There is a section dedicated to the Great Siege of 1565 but the biggest, and best, part of the museum is dedicated to the Second World War and the crucial role that Malta played during those turbulent times. The exhibits vary from anti-aircraft guns, period uniforms of the British forces and items made by German POWs to the Gloster Gladiator nicknamed ‘Faith’ that I had written about here, the George cross (Malta’s award for gallantry) and President Roosevelt’s jeep ‘Husky’. My favourite part of the exhibits was the hall dedicated to the SS Ohio and Operation Pedestal. Computer generated images projected onto the ground show the progress of the convoy of ships that left Gibraltar en route to Malta. It really puts into perspective the amount of men and ships that paid the ultimate price to save the island. The new National War Museum is a vast improvement on the old one. There is ample space for all the exhibits, which are all clearly labelled, and information is readily available through photographic panels and audio visual presentations. It is definitely worth a visit.